This is one of those easy, healthy, gluten free meals you make when you really are hungry and don’t want to spend very long cooking. The meal took me 10 minutes to make and much longer to eat. The trick to this meal, is to have the ingredients on hand! I tend to always have these items around and what I don’t have I pick up after I make my menu for the week. This meal also does not have to stay vegetarian. You can add in whatever cooked meats you have handy. Maybe you cooked a chicken the day before and have leftovers you can use. If you eat dairy feel free to add in just a touch of cheese. I will say we both loved this dish and it was very filling. So just thinking out loud here but if you have a bunch of people headed over to watch the Final Four this weekend and you want to fill them up, not spend a ton of time in the kitchen and not spend a fortune, serve this. Make it even easier and grab some gluten free tortilla chips so they can just scoop and eat. Or heat up the tortillas and let them create their own with an assortment of toppings. You could slice up some jalapeno peppers, maybe a little sour cream or cheese (dairy or non), different types of salsa (there’s a ton out there), some cooked chicken, beef or pork for your non-vegetarian friends joining you (keep it separate and everyone is happy), shredded lettuce, black olives, and really the list could just go on and on. But you get my point, this dish is great for a busy night alone or party time with friends. Home cooked meal that takes less time than running out for a burrito. First grab your largest skillet as this dish expands as you cook. While you heat the skillet over medium high and melt your oil, chop your onions and toss into the pan. As that starts to cook cut up your bell pepper and toss that into the pan. Toss around and let it start to brown. Push that to the side of the pan and toss in your mushrooms to start to brown. 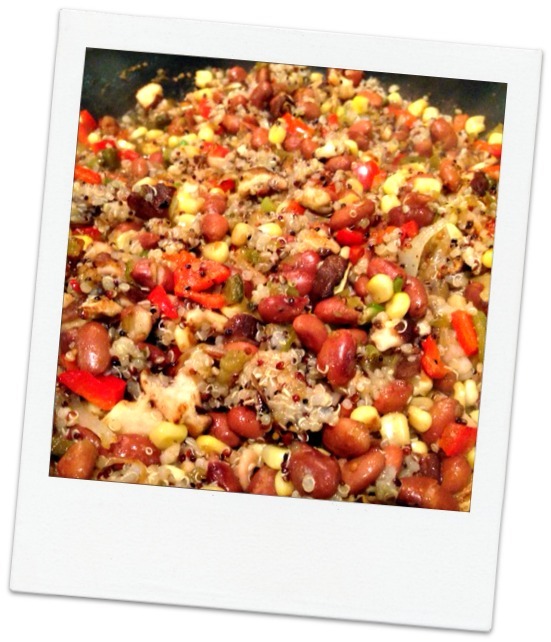 Once that has started add in the corn, the beans and quinoa. Mix well and add in the salsa. Turn the skillet down to simmer and let it warm through. While it’s doing that place the tortillas around the pan so they can warm through. To serve pick up the tortilla, spoon in as much as you like of the filling, give it a splash of salsa and some slices of avocado. If it’s too full to roll up like a burrito, then fold it in half like a taco. It really doesn’t matter because it’s not going to be around very long. Delish! I love this. Will be making this in my house soon!